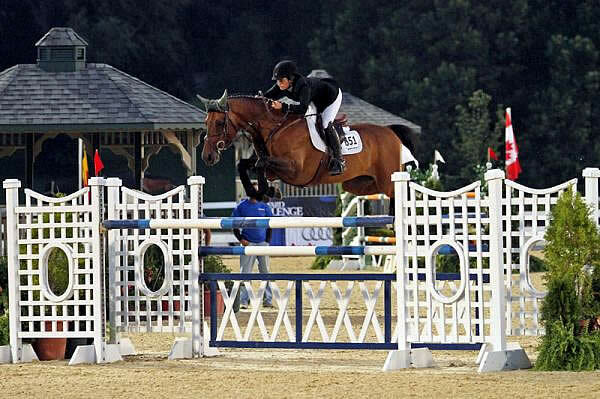 Lexington, KY – July 25, 2013 – The top riders in the country gathered to compete for the winning prize in tonight’s $25,000 Hagyard Lexington Classic, but in the 15-horse jump-off only the fastest and most accurate would have the chance at the prize money. Venezuela’s Pablo Barrios and Zara Leandra scored the lion’s share of the cash after making a mad dash across the finish line in a scorching 43.662 seconds for the win. The pair was two seconds faster than Kaitlin Campbell of Georgetown, KY, and her veteran partner Rocky W, who placed second, while Germany’s Christian Heineking picked up third place with NKH Selena. The first round for tonight’s highlight event was designed by Richard Jeffery of Bournemouth, England, and featured an open water with a scored pole and lath, an oxer-vertical-oxer triple combination, and a final vertical-oxer double combination. It eventually yielded fifteen clear rounds for the jump-off. For the speed round, riders began with an oxer-vertical rollback to the first two fences in the triple combination. They then galloped across the ring to two single oxers, before finishing over a skinny plank to the final oxer. Ireland’s Richie Moloney was the first to leave all the fences intact over the short course with Let’s Go, owned by Equinimity LLC of Stoneybrook, NY, but finished a fraction over the time allowed. They incurred one time fault to net the fifth place award. Moloney had a repeat performance with his second mount, Call Me Number One, once again leaving the rails in place but going too slow and adding a time fault to his score for sixth place. The first rider to finish the course without a single fault was Blythe Marano and Urban, owned by Riverview Farm of Franklin, TN. They easily cleared the obstacles, but broke the beam at a slow 51.246 seconds for fourth place. Christian Heineking made a statement when he entered the ring with NKH Selena, owned by NKH LLC of Dallas, TX, picking up a strong gallop and never holding back. The duo soared over each fence and stopped the clock at 47.676 seconds for an early lead that eventually claimed third. The winners of the first $25,000 Hagyard Lexington Classic in May were ready for action today. Pablo Barrios and Zara Leandra, owned by the ZL Group of Wellington, FL, had a blazing pace and as they wound their way over the track they were able to find each distance to create sharp angles and easily leave a stride out at the final oxer. They zipped through the timers in 43.662 seconds to lead the evening’s lap of honor. Twenty-one-year-old Kaitlin Campbell was not going to give away the win though when she had her chance next with Rocky W. She has owned the Dutch Warmblood for six years and knows him inside and out. Campbell quickly steered her mount over the fences and managed to cross the finish line in 45.662 seconds for the second place award. Zara Leandra and Barrios have just returned from five weeks in Spruce Meadows, which made the mare very ready for tonight’s class. Tonight’s class was the third event in the seven-part Hagyard Challenge Series, which features a $50,000 Leading Rider Bonus to the top rider at the end of the season. In 2010, the winner of the Series was Barrios, who has made it goal for this year as well. The next event for Barrios and Zara Leandra will be Saturday night’s $50,000 Rood & Riddle Kentucky Grand Prix. The class will get underway at 7:00 p.m. in the Rolex Stadium, and is held in conjunction with the Kentucky Horse Park’s Hat’s Off Day, a celebration of the horse and its impact on the state of Kentucky.